The GreenPois0n untethered jailbreak for iOS 4.2.1 has been released and it allows you to jailbreak any iOS 4.2.1 device completely untethered. This will work on the iPhone, iPod touch, and iPad. Backup your iPhone or iOS device before proceeding. Do not use this jailbreak if you rely on a carrier unlock! GreenPois0n 1.0 RC5 includes the ability to have custom animated boot logos. This version of GreenPois0n is superior to the latest Redsn0w release because it does not require developer saved SHSH blobs of 4.2b3. Thank you to Rock_Bege and our other commenters for the solutions. It’s not gonna break lol. my “Loader” icon isn’t green and will not open on my iPhone 4. what now? I think i accidentally jail broke my iPod twice. When I try to turn it on the screen stays black. I have tried plugging it in to my computer and my outlet to the wall. I have also tried doing the jailbreaking thing for greenpois0n again. Nothing will work. HELP pleaseeee! i can’t download redsnow. it says error, what should i do now? How do i unlock my iphone using GreenPois0n Untethered Jailbreak. Please let me know, i need unlock my carrier and jailbreak my device. just go on http://www.greenpois0n.com and press mac or windows or linux, and it’ll download, and then follow the instructions above, then there’s gonna be a green app called loader on your iDevice. Press it, and install cydia on it. TROUBLESHOOTING: Is loader white and not loading? Is loader not showing cydia in it? Then download redsnow and download cydia there. The Cydia servers are likely overloaded, keep trying or wait until network traffic has slowed down a bit. i can’t install﻿ Cydia it said “Error The operation couldn’t be completed. (NSURLErrorDomainerror -3006.) what should i do? please help! Good to know! I’m not upgrading from 4.1 unless my phone crashes or something. But if it does, I’m happy there’s a reliable untethered jb now. JB done. When I run loader it says “Loading Sources” and then it’s blank inside loader. Should I keep trying and eventually an option to install Cydia will appear? I had to try a few times before Cydia downloaded for me, keep trying it will come through. Overall an easy jailbreak, much more user friendly than the last couple redsn0w betas. What about appleTV2? Got 4.2.1, looking for untethered jb! What kind of phone you have? I was having problems getting Cydia to show up in the Loader app. So I installed Cydia using rednsn0w. It worked like a charm. 1) Use the latest version of redsn0w: 0.9.7.b6. 2) Use redsn0w AFTER you have jailbroken with greenpois0n. 3) SKIP STEP TWO in the redsn0w directions linked to above. That is, do NOT reinstall the iOS firmware. 4) Do NOT use the “Jailbreak Monte (untethered)” option. Just select “Install Cydia”. greenpois0n handles all the untethering stuff. Somehow, using redns0w this way installs Cydia without screwing with the greenpois0n untethered jailbreak. @iHacker, I hadn’t even thought about that method. After getting errors with Loader.app and then a white Cydia icon, this is the ticket. Thanks for sharing. I can confirm iHackers method works like a charm. I did greenpois0n, then redsn0w to get Cydia. Worked OK, but I needed to wipe the phone clean to prepare to sell it (should have done that before I started, but oh well). After I did the “erase all content and settings” option, the device booted to an all black screen and didn’t proceed (I’m assuming DFU mode). I was able to get the original IOS 4.2.1 reinstalled via iTunes, but now I can’t rerun greenpois0n jailbreak. It fails, then my Mac’s mouse (connected via USB) gets choppy until I close the greenpois0n app. Sometimes I have to remove and reconnect the mouse to get it to work again. Tried rebooting the Mac with the same issue. Any suggestions? I can confirm that the greenpois0n then redsn0w will put cydia on your springboard. I had the same problem with greenpois0n and the loader app being empty. So I ran redsn0w and selected install cydia. Make sure thats all you have checked, let redsn0w then do its thing and cydia now appears. Thanks greenpois0n and thanks redsn0w for freeing my phone. Now here is my real question. Since I jailbroke with both programs (see post above) and redsnOw implemented limera1n is my iPhone 4 now pwned for life? I see there is a mention of Apple TV 2g, but no instructions. Does this work now untethered? That would be great as I think the tethered method is just useless. will there be greenpoison download for windows?if yes when? After instaling with greenpois0n, the cydia is already downloaded. And it is appearing on my board. But i cant click it. Is there something wrong with my cydia? 6: after it patches the kernal click next and select the option “Install Cydia” click next turn off you device and follow the instruction on your computer. 7: after its done on the computer check your device after all the jailbreaking is done your phone must be activated now and cydia must be installed. 8: Go to cydia, login as user click manage> sources then look for a source called “repo666.ultrasnow.com” and install it. 9: Reboot your device and your device is now unlocked for any carrier. This is how i did it, the instructions are mostly given already. Hope it works. I can not get my iphone 4 with 4.2.1 to jailbreak I get a failed everytime. I have used this before with no problems. Also your instructions don’t seem right after I click on jailbreak the first time there is not another button that says jailbreak to click on again. I just tried my ipad with 4.2.1 and had no problem jailbreaking it but still no luck with the iphone any suggestions? Got it to work not sure what was going on. i had jailbroken my iphone 4.1 using another jailbreak software. 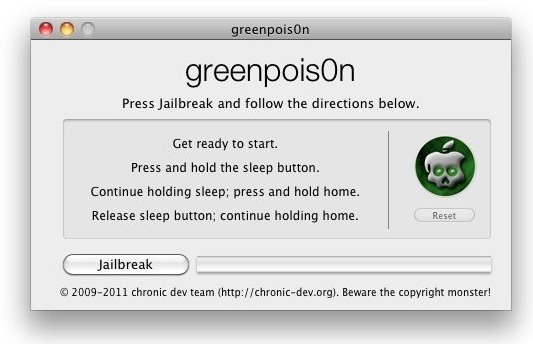 i was wondering if i have to update to the lastest iOS before using greenpoison. i pluged inj my iphone and itunes ask to restore!!! I followed the tut today. JB went fine on my 4.2.1 iphone4. Installed cydia, install0us, appcake+, appsync, and a few games. Now my phone will not charge or connect to the PC. I have rebooted, and tried on different PCs, but nothing. The ‘bumper’ I fitted did not allow a proper connection. I just used greenp0ison to jailbreak my iPod Touch 3g, 8gb. Everything went through but after I finished the jailbreak I just had an empty loader icon, I read about using redsnow after but they don’t have the version for windows for my iPod. Any suggestions on what to do next? Help! I put mine in DFU mode and then I clicked Jailbreak and nothing happened and my iPod is not turning on! Please help! P.S the Jailbreak started out working fine but it looks like when the phone software was being updated and it should have been doing the restarts something bad happened!! Good luck. it seems that you have solved the problem anyway. while i am still working on it. failed to get apple…after 730 sec. i get nothing till now. any suggestions? I downloaded greenpoision, and that was grand, and the skull icon came up, but i pressed off, and now all that comes up is the apple thingy…help! Is my itouch broke? All this white writing pops up, and then it says Giving up… at the end, help? when i use greenpois0n and it give you the procedure in which you put your device in dfu mode, mine does not work it always says try again even though im doing it perfectly can you help? hey guys help me out i have jail broked my 3gs iphone to 4.2 os unable to sync with itunes what to do now…? Once you jailbreak, you cannot opperate with itunes now, even with the newer versions, if anyone is currently doing the 4.2.1 on 2nd gen ipod, you cant use itunes once you do a jai break, go to version 10.2 and you can download with that. wen i tried to install it, it always stops and says failed to get appleS5L8920xarm7m after 130 sec wat do i do? i somehow have the same problem. how did you manage to make it? I’ve also tried using redsn0w and pwnage tool but this particular phone always gets a “firmware file incompatible” error in itunes. I’ve jailbroken phones before with success, but I don’t know why I can’t get this one! Any help is much appreciated! I tried to JB my Verizon IPhone 4 4.2.1, I did everything and after i saw the greenpoison icon on the start up,then the phone starts rebooting and the connect to itunes icon pops on the screen, and then i can’t use my phone unless i restore it on itunes. HI I REALLY REALLY NEED HELP!!! i had my ipod already jailbroken, i pressed the “erase all media” button, it erased everything, but it’s stuck on the apple logo. I have an iphone 4 running on 4.2.1 but with a tethered jailbreak using Redsn0w. If I “re-jailbreak” my phone will i lose all my apps that i got from cydia and tweaks? he loader app had cydia in it and i downloaded it, but it only downloaded up to 45% and then it said ”extracting”? can somebody advise me on what else to do? hi i got iphone 4 when i used it my screen comes black and some txts appear and my phone got hang.. cant do anything with my phone.. what to do?? please help! I have just recently jailbroken my old iPod touch. It had iOS 4.2.1 on it. The problem I have with it is that it won’t charge at all. No matter where I plug it in at, the iPod won’t charge. Is there anyway to fix this? Biggest waste of 3 hours, doesn’t work. My iPod Touch 4g Jailbreaked By GreenPoison_i Wanna to Update Device from 4.2.2 to 4.3 & i do a mistake_im using of restore factory! When My Device Rebooting After That i See Green Poison Skull on My Screen & My Device not up coming & Just Show Me Skull on Screen! Do You Know a Solution for My Problem? ?